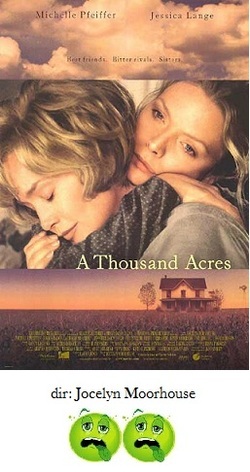 A Thousand Acres is based on Jane Smiley's award-winning novel, itself an updated retelling of Shakespeare's King Lear, and it stars Jessica Lange, Michelle Pfeiffer, Jason Robards and Jennifer Jason Leigh. So, how did it fail? It undermined it's own premise in a desperate effort to pick the wrong side. Based on King Lear but it picks the wrong side? Yup. But we'll get to that in a moment. The story here is about Robards, a successful but aging farmer who decides to go ahead and divide up all his land amongst his three daughters, Lange, Pfeiffer and Leigh. As expected, Lange and Pfeiffer agree to take the land, but Leigh, Robards favorite, thinks this is a bad idea and only misery will be borne from this decision. By saying the truth and not what he wants to hear, Leigh incurs Robards's wrath. So far, so good. The acting by all involved is first rate and the story is interesting and has a special pleasure for those familiar with King Lear. Then things get derailed. For some reason, the bulk of A Thousand Acres focuses on Lange and Pfeiffer which means the equally important story of Robards and Leigh gets completely lost. Then the screenplay continually stacks the deck in favor of the two older daughters. If you're going to ape King Lear, then the two older daughters should be the villains. Here, they aren't. To make us side with them even more we get all kinds of unnecessary plot twists, such as making them suddenly remember being molested by Robards as children. We also have a cancer subplot thrown in for good measure and many other topical women's issues so that we side with Lange and Pfeiffer even more. All of this makes us hate Robards, and then hate Leigh for being the only one to care for him now that his mental faculties begin to escape him (and since the screenplay almost completely forgets to tell the story from the perspective of Robards, this event appears to happen out of the clear blue); the big climactic moment with the patriarch bellowing with madness in the middle of a thunderstorm completely loses any impact. When A Thousand Acres finally ends, it becomes pretty clear that it pretty much amounted to little more than a slightly slicker made-for-Lifetime movie. Having never read the source novel, I can't say for sure how much of what's on the screen matches it. If it does, then I have a feeling I can live the rest of life without reading it.